The linker may choose any COMDAT. The data referenced by the COMDAT must be the same. The linker will choose the largest COMDAT. No other Module may specify this COMDAT. The data referenced by the COMDAT must be the same size. Definition at line 23 of file Comdat.h. Get the Comdat assigned to the given global object. Definition at line 32 of file Comdat.cpp. References G, llvm::GlobalObject::getComdat(), and llvm::wrap(). Definition at line 42 of file Comdat.cpp. 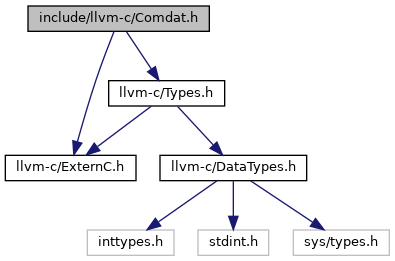 References llvm::Comdat::Any, llvm::Comdat::ExactMatch, llvm::Comdat::getSelectionKind(), llvm::Comdat::Largest, llvm_unreachable, LLVMAnyComdatSelectionKind, LLVMExactMatchComdatSelectionKind, LLVMLargestComdatSelectionKind, LLVMNoDuplicatesComdatSelectionKind, LLVMSameSizeComdatSelectionKind, llvm::Comdat::NoDuplicates, llvm::Comdat::SameSize, and llvm::unwrap(). Return the Comdat in the module with the specified name. It is created if it didn't already exist. Definition at line 28 of file Comdat.cpp. Assign the Comdat to the given global object. Definition at line 37 of file Comdat.cpp. References G, llvm::GlobalObject::setComdat(), and llvm::unwrap(). Definition at line 58 of file Comdat.cpp. References llvm::Comdat::Any, llvm::Comdat::ExactMatch, llvm::Comdat::Largest, LLVMAnyComdatSelectionKind, LLVMExactMatchComdatSelectionKind, LLVMLargestComdatSelectionKind, LLVMNoDuplicatesComdatSelectionKind, LLVMSameSizeComdatSelectionKind, llvm::Comdat::NoDuplicates, llvm::Comdat::SameSize, llvm::Comdat::setSelectionKind(), and llvm::unwrap().